"I had this at a party and couldn't get it off my mind. 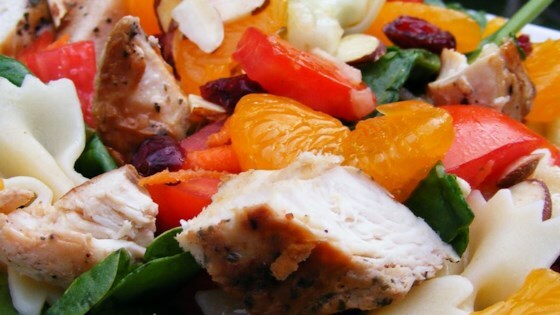 It's a fruity Asian chicken salad that even my family's picky eaters enjoy. I bake my own chicken for more flavor, which adds to the prep time, but pre-cooked or canned chicken will also work just fine." Bring a large pot of lightly salted water to a boil. Add the bowtie pasta and cook for 8 to 10 minutes or until al dente; drain, and rinse under cold water. Place pasta in a large bowl. To make the salad, toss the cucumber, bell pepper, onion, tomatoes, carrot, spinach, mandarin oranges, chicken, and almonds with the pasta. Pour the dressing over the salad mixture, and toss again to coat evenly. Serve immediately. See how to make a healthy Asian-inspired pasta salad with chicken. I made it today. I did not care for it and neither did my husband. Too oily and the flavor is blah. Followed the recipe except for the almonds as I did not have any. Will not make again. I join this site to review this recipe. I can not believe how good this is. I followed the directions as written. We love this salad! I have used frozen grilled chicken strips and freshly grilled chicken breast, either way works great. The dressing is awesome and great color and texture.